This is how I like to eat during the summer. Yes, there is space at the table for burgers, raw salads, and refreshing sorbets, but one of the simplest pleasures of the season can be flavored with little more than garlic and white wine. Dunked with grilled bread, this meal is just about as blissful as fresh summer dining can get. 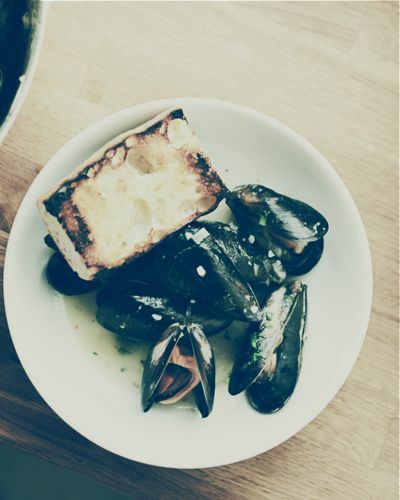 Working with mussels is also an experience worth discussing. They're living things, after all, and when they're soaking in water get close to the bowl and just listen quietly for a moment. You'll hear them opening and closing, clattering, breathing, ridding themselves gritty sand and letting it fall to the bottom. It's a special moment, I think, between protein and cook. To prepare the mussels, immediately unwrap them when you return from the store and place them in a large bowl in the refrigerator. This will allow them to breathe. 20 minutes before cooking, fill the bowl with cold water and let them sit. They'll open a bit, releasing any lodged sand, and should close again before cooking. The final step is removing the beard, the fiberous threads attached to their shells. To remove the beard, hold the mussel in one hand, cover the other hand with a dry towel, and grasp the beard; give it a sharp yank toward the hinge end of the mussel. Discard any that don't close up again, or that don't open after steaming. In a large Dutch oven, heat a few turns of olive oil over medium heat. Add the onion and stir to coat. Cook three to five minutes until softened, then add garlic and cook until just fragrant, about a minute. Add the flour and vigorously whisk until dissolved. Add the wine and continue to whisk until the sauce is thickened. Slowly pour in the mussels and cover. Cook until mussels open, about five to seven minutes. While you wait, grill bread over medium heat and sprinkle with sea salt. When the mussels have opened, scatter parsley over the top and serve with bread in low bowls with plenty of the sauce for dipping.